We offer you the chance to experience and enjoy the stimulating sport of surfing, with surf-courses and coaching to match your needs – for every level and every age. 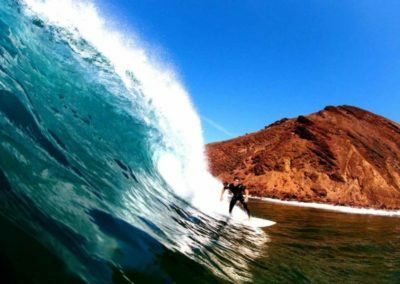 Daily surfing lessons give you the chance to learn more and improve your surfing skills, in regular or intense surfing lessons, in the endless summer climate of Fuerteventura. We would like to give each of our guests the best opportunity to develop their surfing skills according to their skill level. It is important that we provide surfing training that is well matched to your starting level, allowing you to make good progress. If one of our surfing instructors in the water is of the opinion that you cannot meet the appropriate skill level, because you lack the power to paddle, the appropriate fitness level, or the appropriate skills, you agree in advance that he may request you to leave the water. We do this not to antagonise you, but for safety reasons, reducing the risk of injuries to you and other course attendees, as well as the dangers of fatigue. We ask for your understanding! 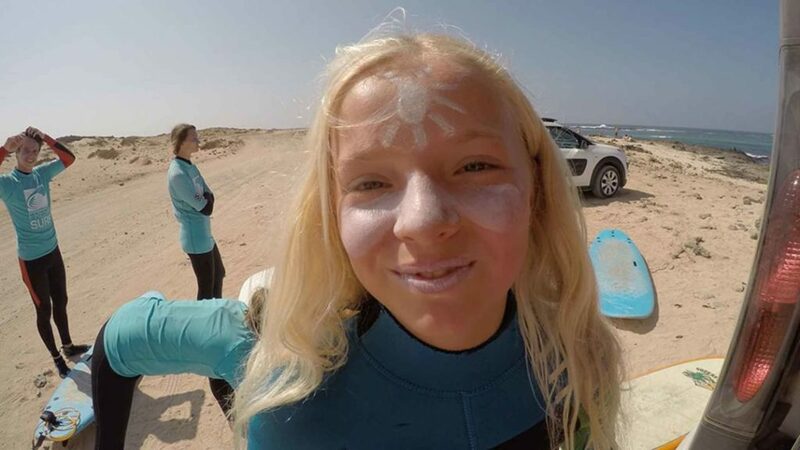 So if you are not sure that you are already an advanced intermediate surfer, we would suggest instead opting for a first day on the beach, giving you and our surf instructors the possibility to assess your skills realistically. Thank you so much! If you have never been on a surfboard before, then this is the ideal way for you to enter the world of surfing. Surfing is definitely not an easy sport, and so it is important to start with the best hints and techniques right from the start. We start our surf course with a short theory unit, where we teach you the most important safety rules when surfing. The main focus is your safety. Afterwards we head off in our Surfer-vans to the sandy beach in El Cotillo, taking with us the best and most suitable equipment for you. After a little warm-up we go straight into the water. We show you how to surf step by step until you get up on the board (Take-off). We will show you how to walk on water with a smile on your face (and ours). If you still need to polish up your take-off and you want to keep on practising under supervison on the beach in the white water, then this surf course is the right choice for you. Here we will also explain the proper technique for paddling, explain the techniques of traversing waves and explain how to paddle into the line-up. You will learn how to surf waves in the white water frontside and backside as well as how to trim the board to surf a wave for as long as possible. You have completed one or several surfing courses, you can already paddle into the line-up, you have mastered the take-off and you can surf a wave straight towards the shore, and maybe also surf the waves partly sideways? Then our advanced intermediate course is the right choice for you. Here we will optimize your technique and work on your timing as well as your positioning in the water. We will help you to reach the next level and improve your style. For beginners, intermediates or advanced surfers, we offer private surf coaching, in which you will be individually coached in the ratio of 1 surf instructor to 1 surfer or 1 surf instructor to 2 surfers. The focus here is on ongoing, individual feedback that will help you to reach your goals even faster. If you would like to book a surfing instructor on an individual basis, this is the right surfing course for your needs. 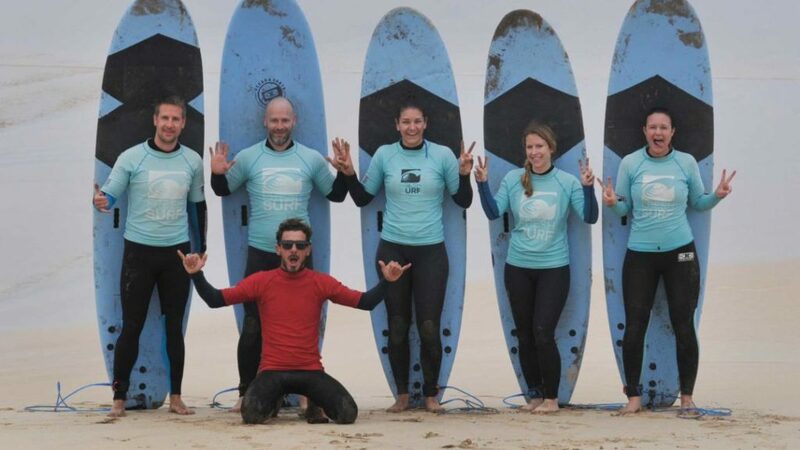 For beginners, intermediates or advanced surfers, we offer private surfcoachings, in which you will be individually coached in the ratio 1 surf instructor to 1 surfer or 1 surf instructor to 2 surfers. The focus here is on an ongoing, individual feedback that will help you to reach your goals even faster. If you would like to book a surfing instructor only for you, this is the right surfing course for your needs. 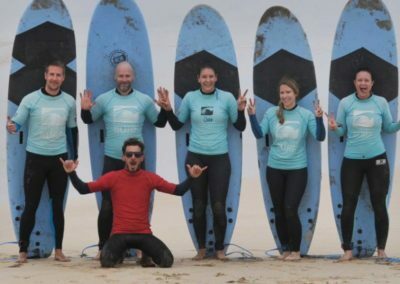 All of our surf courses will be held in groups of up to five people per instructor. However, if you want to improve quickly, we offer and recommend individual coaching. You will have your own surf instructor who provides you with personalized feedback on your movement and surfing technique. In addition you will be able to freshen up your theoretical knowledge about surfing. Depending on the tide and the conditions, we offer two surf lessons per day from Mondays to Saturdays. Generally we do not offer surf courses on Sundays. However individual coaching and courses outside of our normal business hours can be arranged upon request. Normally, your surf courses will be on consecutive days throughout the week – as long as you don’t specify otherwise. We are happy to try to accommodate your wishes – just come and talk to us! 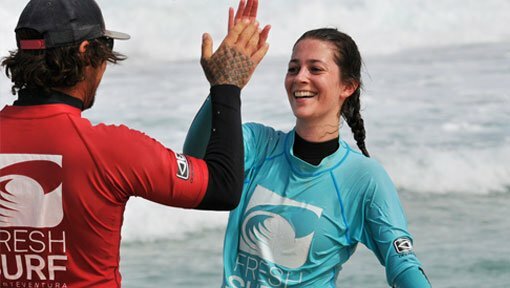 How do I know which surf course will be the right one for me? Prerequisite: desire to try something new and create a memory of a lifetime. Surfing is for everybody, no matter how old you are or your skills level. 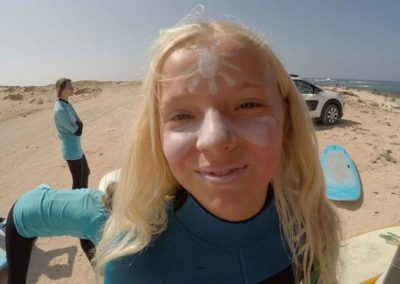 Our surf-school on Fuerteventura offers you an active holiday experience by and in the sea. Come and play with us in our favorite playground – the Atlantic Ocean. In our surf courses one surf-coach guides a group of max. 5 students – a group of 8 students is common for other schools. 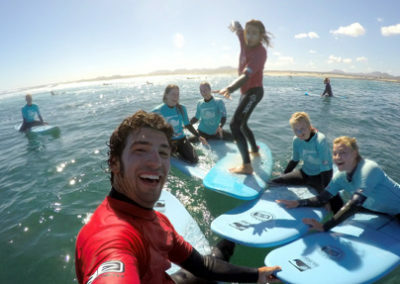 This way, we can offer you the best possible tutoring and make sure that everyone achieves their personal surfing goals. 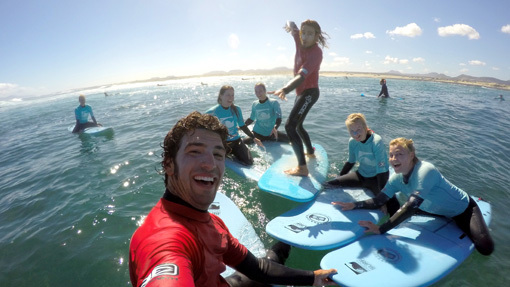 Do you want to raise your surfing skills quickly with the support of a professional surf coach? With a coach who is training you alone? Private coaching is the perfect way to improve your surfing in a very short time, as the personal guidance optimises your training. The surf coach takes account of your individual surfing goals, helping you with tips and detailed feedback throughout the lesson and afterwards. When do the surf courses start? You can start on any given day between Monday and Saturday, normally one day after your arrival. If you would like to start on another day, please let us know. Do I have to do the surf courses on sequential days? No. We normally plan your schedule to include sequential days throughout the week. But if you would prefer some breaks in between, just include a note when booking and we will change the schedule accordingly. Can I book (further) surf-courses locally? Normally, you can book (additional) days locally. Depending on the season, it may happen though that our courses are fully booked. That’s why we recommend booking in advance, even though we will always try to include you on further courses where possible. Can I cancel booked courses locally? Courses that have been booked and paid for cannot be cancelled locally. If you can’t participate and let us know in advance (at the latest 18:00 the day before), we can try to move your course to another day – as long as we have free spaces.